Our next Twitter chef was chosen by Di; I was really excited to see that she picked Jacques Pepin. Hubby and I have spent many hours watching his Fast Food My Way show on PBS, although I've never actually made a Pepin recipe. Tonight we needed a quick meal, so I whipped up his ricotta dumplings with red pepper sauce. I got the recipe here, although you can also find it here or (a slightly adapted version) here. The sauce was made by simmering a cut up red pepper with a cut up tomato in water. These are then run through a food mill to get rid of the seeds and skins. Salt, freshly ground pepper, and corn starch are stirred in, and finally butter and olive oil are added. I think the sauce should've been much thicker, and if we weren't in a rush to eat and get the kids to bed, I might have spent more time getting it to thicken. The dumplings were also easy: ricotta, Parmesan, salt, pepper, an egg, and some flour were whirred in the food processor for ten seconds. Then I stirred in some chives. I dropped the dumplings into a big pot of simmering water for ten minutes. When the dumplings were finished, I drizzled some sauce over the top, and served them with left-over chicken, salad, and some berries. Hubby thought this dish was quite yummy; he said they were like a fancy hors d'oeuvres you might get at a wedding. I didn't love them; I just didn't think they had a very strong flavor. I'm hoping I can get to some other Jacques Pepin recipes this month! Not only have I never made puff pastry before, but I've never even cooked with it. Whenever I see it in a recipe, I get annoyed that they want me to use store-bought when I could just make my own...but then I've never made my own. It's a vicious cycle. And I knew that it was a little intimidating...something about rolling butter and flour 500 times, keeping everything cold, if you breathe wrong, it all melts together and is ruined. But I also knew that it was coming up in our Modern Baker Challenge. Andrea, Phyl, and Sara have already made the puff pastry and elephant ears, and seeing their results really made me want to try it. And then Marthe picked empanadas for our next Bake! twitterbake, and they're made with puff pastry. Looks like today was the day! Also, while I was waiting for my dough to cool, I found a link on Nick Malgieri's website to a video of him demonstrating the puff pastry recipe from Bake! on Martha Stewart. It was so helpful!! I will definitely have it by my side the next time I make puff pastry, and I hope other beginners watch it, too. The rest of the elephant ear preparation was easy. I rolled out the dough in sugar, folded it over on itself per the instructions, and put it back in the fridge. Then I sliced the dough into 1/2 inch segments, dipped them in sugar, and placed them on my silpat-covered jelly roll pan. The only issue was that they took way longer to bake than they were supposed to and I needed my oven for dinner...they ended up taking about 20 minutes or a little longer. These were easy and awesome...I'm really glad I only made part of a batch because they were all gone within a couple of hours. Yum! I'm most of the way through my SPRING break today, and guess what my family spent the afternoon doing? Yes, shoveling. AGAIN. This longest, coldest, snowiest winter is taking its toll...kids have cabin fever, adults are crabby, roads are cracking, vehicles are groaning. So I declared war on winter with our dinner tonight...in fact, I skipped spring and went right to summer! Strawberries! Chips and guac! These awesome taquitos that Tracey posted, interestingly, the day after my hubby bought a bag of frozen ones because he'd been craving them for weeks. Seasoned black beans. The taquitos were a huge hit. Hubby was in seventh heaven, declaring them way better than the frozen variety he's been craving. And both kids loved them, which shocked me. I made both corn and flour varieties, figuring that hubby would like the corn (more traditional) and the kids and I would prefer the flour (what we usually eat). Interestingly, the little guy and I both preferred the corn tortilla ones. Hubby and the little girl liked both equally. I made a huge batch of filling, which made about a dozen taquitos for dinner (we had a couple left over) and another dozen and a half to freeze. 1. Preheat oven to 425 F. Spray a jelly roll pan with cooking spray. 3. (If using corn tortillas, warm them a couple at a time in the microwave, under a damp paper towel; mine took 22 seconds.) Spoon 3 tablespoons of filling onto tortilla and roll as tightly as you can. Place seam-side down on the pan. 4. Spray the taquitos with cooking spray and sprinkle with kosher salt. Bake for 20-25 minutes, until crisp and golden (ours took about 25 minutes to get there). Our final Mellow Bakers bread for March is sunflower seed bread with rye sourdough. I was not a big fan of the sunflower seed rye from the BBAC, so I just made half of the recipe. Last night, I made a sourdough starter and a rye soaker. I couldn't find rye chops, so I used some coarse rye meal, covered with boiling water. Today, I toasted some sunflower seeds and then mixed everything together (bread flour, salt, instant yeast, water, starter, soaker, seeds, and malt syrup). The dough was really, really sticky. I knew Andrea had given the dough a couple of stretch-and-folds to help strengthen it. I did one stretch-and-fold in the middle and it definitely helped, although I still struggled to shape the dough at the end. I baked it with steam for about 30 minutes, and then ran out to the grocery store while hubby made our dinner (plain ol' grilled cheese for the kids, cheese-mustard-ham for me, and cheese-ham-mustard-sauerkraut-banana-peppers for himself)...unfortunately, he didn't think to take a picture of the loaf before he sliced it for the sandwiches. The bread and the sandwiches were okay. The little guy didn't like his at all and the little girl picked out all of the sunflower seeds and put them on my plate (no surprises there). Hubby loved his sandwiches; mine was okay. Definite winner for March: whole wheat levain with multigrain soaker; I think everything else will go onto the "will not make again" list. This week's Bake! recipe was chosen by Andrea, and she selected chocolate chip cookies. According to Nick Malgieri, these are the ORIGINAL chocolate chip cookie, based on the original Toll House recipe. In this house, we love cookies, we love chocolate, we love chocolate chip cookies...this was a no-brainer. I will admit that I haven't experimented much with chocolate chip cookie recipes since I discovered our perfect recipe, which is based on the America's Test Kitchen Family Cookbook's recipe. Like Phyl and Andrea before me, I left out the walnuts, agreeing that they don't belong in chocolate chip cookies. NM says to make sure your butter is softened, but not too much or you'll end up with flat cookies; my butter was barely soft at all and my cookies were still really flat. I experimented with cooking times: 10, 11, or 12 minutes. They were varying degrees of golden to deep golden. Usually, I like softer, thicker cookies, but the ones that cooked a little longer had an awesome, chewy, almost toffee-y quality that was pretty addictive. These were totally unlike our usual chocolate chip cookie, but were so good in their own right. I'm not sure I'd make them for gifts or a gathering, as their looks were very unpredictable. But I'm positive we'll make them again for us! I've found another use for my ghee! I've always loved naan, although I haven't had it in a few years. When I saw Tracey's post about homemade naan a couple of weeks ago, of course I bookmarked it. And now that it's spring break, and I have time, I was happy to make Cook's Illustrated's tikka masala, white rice (with ghee in place of butter...soooo good! ), and naan! I followed the recipe and instructions for naan on Prerna's site, and it was pretty easy. I whisked flour, baking powder, baking soda, salt, and sugar together. And then I combined some warm milk with some of my homemade yogurt, and mixed it in with the dry ingredients. The dough rested for two hours. I dumped the dough out onto a lightly floured board and attempted to knead it; the dough was really wet and sticky and I had to flour my hands and the board quite a bit...but after a few minutes, it became nice and satiny. I split it into eight small balls, which I flattened with my hands and then sprinkled with garam masala. My hubby and I are new to garam masala, and I think it's fair to say that we're somewhat addicted. I'd actually pulled out some other spices to experiment with as well, but we just couldn't break away from the garam masala, although I did end up sprinkling on some kosher salt, too. I brushed a little water on the other side and then cooked it, covered, in a skillet for about a minute. Perna suggests cooking the other side above the open flame on a gas stove, but for some reason, one of my burners wouldn't light and I was using the rest to cook dinner, so I just cooked both sides in the skillet. It was awesome and easy. I brushed some ghee over the naan after taking them off the stove. I can honestly say that I could eat this stuff every day; it was that good. I was really surprised that neither of my kids liked it, but my hubby and I were more than happy to finish theirs. This recipe will be a frequent attendee at our dinner table! Before we got together, my hubby's standard "breakfast" was a couple of doughnuts and a can of Pepsi. Happily, it didn't take me long to exert my influence...within a couple of months of spending mornings with me, he'd gotten accustomed to a healthy breakfast first thing and his students would complain that he was crabby if he skipped it. It's not just doughnuts; many of my hubby's favorite foods are deep-fried. As I started cooking more over the past couple of years, I tried a lot of things I never thought I would. I'm someone who spent most of her life unable to look at a piece of meat with bones in it, unable to deal with the smell of peppers or anything spicy, unable to stomach the look or taste of red meat. I can now easily rip the insides out of a Thanksgiving turkey, can cook and cut bone-in chicken, can whip up a Sunday potroast with my eyes closed, can slice and dice a dozen jalapenos. But I told my hubby: even with my expanded food horizons, don't ever expect me to fry anything in my house! 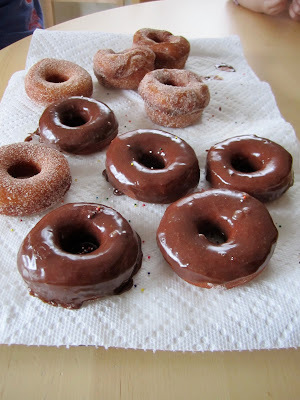 Even so, when Di posted a recipe for doughnuts nearly a year ago, I bookmarked it. My hubby loves doughnuts, and I love being able to make his favorite things. I looked at the recipe periodically, but just could not bring myself to try it. I hate the smell of frying foods! And then, a couple of months ago, Cooks Country had a recipe for homemade apple fritters. My hubby and my dad love apple fritters. And I just had to try it. So I bought a bottle of peanut oil, bought a candy/deep fry thermometer, dragged out my cast iron dutch oven, and gave it a try. My hubby was thrilled that I deep fried, and he loved these apple fritters. I have to admit that even I ate a few bites the day I made them. My kiddos didn't really like them, and my dad said they were way too greasy. Success? So-so. I went back to Di's recipe. I knew that Andrea was also nervous about deep frying, but had had success following Di. So I bought a gigantic tin of crisco (I'd remembered reading a post from America's Test Kitchen that solid vegetable shortening was the best vehicle for frying doughnuts, although when I went back to confirm, I couldn't find where I'd read it) and whipped up a batch of all-purpose sweet dough from Peter Reinhart's Artisan Breads Every Day. You're supposed to let the dough rise overnight, but I made it first thing in the morning, and when we returned home in the afternoon, the dough had already more than doubled, so I pulled it out. I grabbed about 440 g of dough and rolled it out to about 1/2 inch. I used my 2 1/2 inch biscuit cutter to cut out circles. Unfortunately I don't have a tiny cutter for the centers, so I actually used the wide end of my turkey baster. I ended up with 10 doughnuts and about 15 doughnut holes. I let them rise on a parchment-lined sheet pan for a little over an hour until they were getting puffy. Then I dumped 6 cups of crisco (gross!) into a pot and heated it over medium to 375F. I cooked them for 45 seconds per side, and only did a few at a time so I could carefully monitor the temperature and keep it right at 375. I removed the cooked doughnuts to a paper towel-lined cooling rack, and then coated half in a cinnamon sugar mixture (3 tbps white sugar with 3/4 tsp Vietnamese cinnamon) and dunked the other half into a chocolate glaze (1 ounce of semi-sweet chocolate chips mixed melted with 2 tbsp of half-and-half, a drop of light corn syrup, and a little over 1 cup of powdered sugar, sifted). The 15 doughnut holes were completely gone by the time I'd finished dipping and glazing the whole doughnuts (and by the time I got the camera working). Hubby said he considered it a sign of personal growth that there were four doughnuts left when we went to bed last night. My mom came over for her birthday dinner last night. I'd called her earlier in the week and said, "I'll make you anything you want for dinner...what would you like to order at Abby's restaurant?" She said (in typical mom form), "Oh, anything you want to make is fine! I don't want to have to pick. I just want it to be easy for you! Whatever's no work! We can even order in pizza!" For my birthday (in addition to a fabulous new apron and an heirloom cookbook of my husband's family's recipes), my in-laws gave me Food & Wine's book on Pasta. It is awesome...it has a section on making homemade pasta, Italian pasta dishes, Asian pasta, American pasta, super fast pasta. I decided to try their basic egg pasta recipe. They list egg and flour quantities for 3/4 pound and 1/2 pound of pasta, but I wanted to make a full pound. They call for extra-large eggs; I only had large. Plus they indicate that you should add 2 extra tablespoons of flour if you're using the food processor method (which I was). They give a really nice description of how to tell if your pasta dough is ready, so I ended up going entirely by feel this time. I ended up using 4 large eggs and about 3 cups of all-purpose flour. I let the dough relax, wrapped in plastic, for an hour while I worked on my mom's cheesecake, although they say the resting stage isn't necessary if you're going to roll the dough by machine (which I was). The dough rolled out easily; I learned my lesson with flour last time. 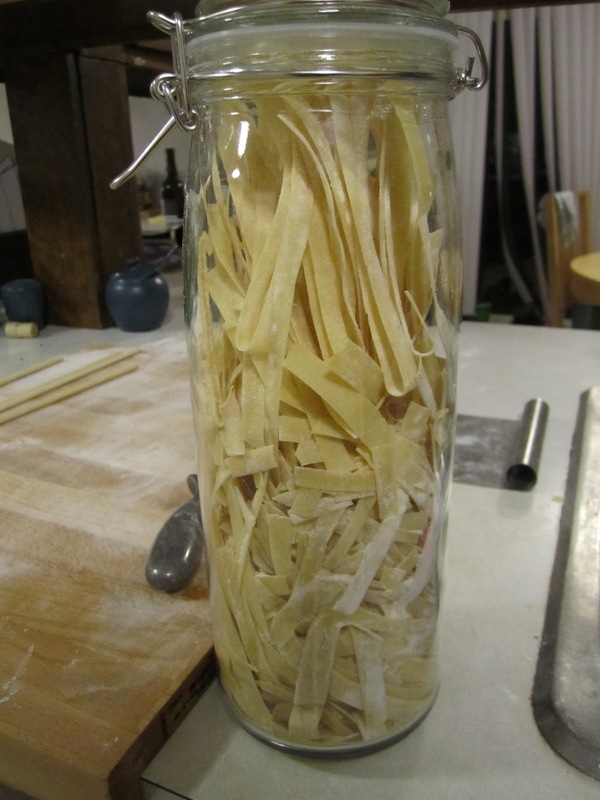 My pasta machine handbook says to roll out to 4 or 5 for fettucine; the cookbook says 6. 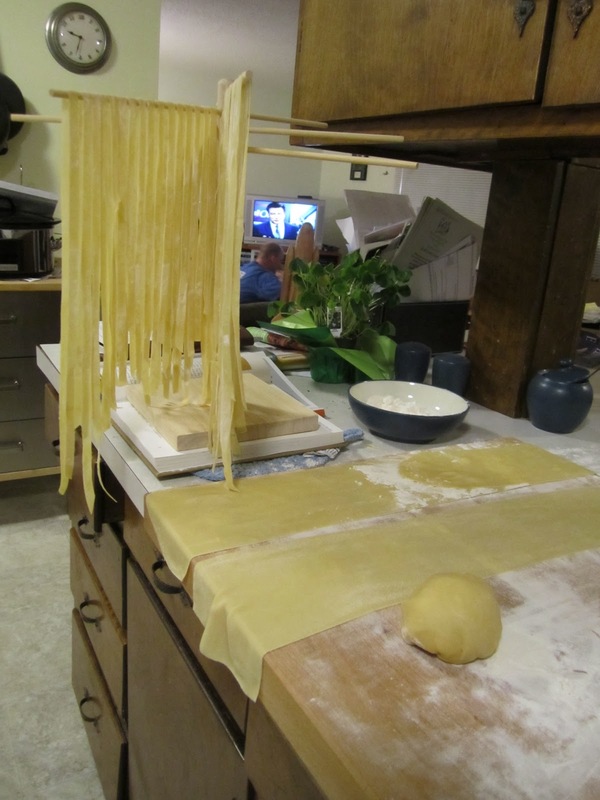 I decided to try it, and I ended up with eight sheets of very thinly rolled pasta. They claim that, even if you roll by machine, you should never cut by machine. After my major difficulties with using my spaghetti and fettucine cutters the last couple of times, I was actually happy to read this. I used my pizza wheel to cut the folded sheets into 1/4 inch strips. 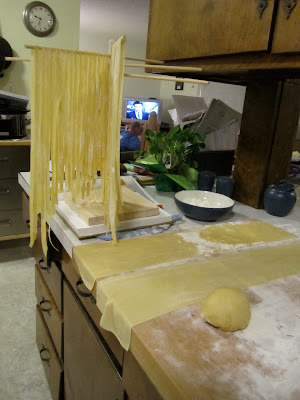 It was when it was 10:00 at night and I was hanging each strand up to dry that I said to my hubby, "I don't think that pasta making is going to become an obsession like bread making has....it's too time-consuming and tedius, and the results aren't that much better than store-bought." After an hour, I put the pasta into a glass jar and then into the fridge. The next night, dinner was pretty easy. I boiled the pasta in a pot of salted water for about 2 or 3 minutes. I heated some of our favorite spaghetti sauce, which I'd had in the freezer downstairs. I used the pain a l'ancienne recipe from ABED to make garlic bread. (I actually made 6 loaves; we used 2 last night, but I turned them all into garlic bread and froze the other 4.) And we had cheesecake with strawberries for dessert. This pasta was awesome, by far the best I've ever made. 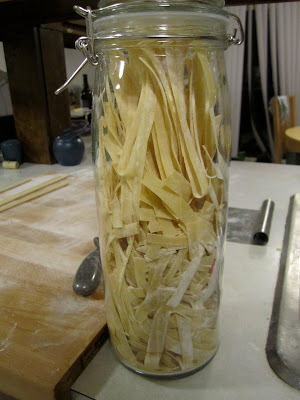 With pasta this good, I can see why I would want to make homemade pasta frequently. I used the leftovers in my favorite chicken noodle soup recipe tonight...I don't think we'll be able to go back to the stuff from a box! I'd never heard of Sally Lunn bread before a few days ago. Deb posted a recipe for it at Smitten Kitchen, and I was intrigued...I was intrigued by the description of the bread as a low-effort, not-as-buttery brioche, and I was intrigued that it was a yeasted bread with methodology more closely resembling a quick bread. So I made it! It was really easy: all-purpose flour, sugar, salt, and yeast, combined with warmed milk and butter, and finally eggs. Mix for a few minutes, rise until doubled (mine took almost two hours), dumped into a floured and buttered loaf pan, 30 minute rise, and bake. Nothing special by itself, but we turned it into French toast for dinner tonight. Hubby declared it right up there with the best French toasts we've ever had. Yesterday, I saw some of my Twitter pals discussing this recipe from King Arthur Flour for potato chip cookies. I happened to be on my way to the grocery store and happened to have taken today off of work to play with the kiddos: potato chip cookies sounded just intriguing enough to try. In my family, we don't believe that cookies without chocolate chips should exist, so I added a sprinkling of mini chocolate chips. I'm not sure we would've liked them without the chocolate, but with the chips, they had the perfect combination of salty and sweet. Hubby said, "It's like when you're eating a chocolate chip cookie and then it's too sweet so you need to grab a handful of chips only they're already in the cookie!" I made these with an original kettle chip, and they weren't very salty. I think next time, I'd up the anty by using a saltier chip: kettle chips with sea salt, maybe, or hubby even suggested salt and vinegar chips. Our Mellow Bakers breads for March are two varieties of whole wheat levains, sunflower seed bread with rye sourdough, and aloo paratha. I've already made both of the whole wheat breads. I made the whole wheat levain with multigrain soaker for World Bread Day last year. It was one of my very favorites from Hamelman, and I've made it several times since then. The plain whole wheat levain, which I made in the hopes that my kids (who don't like seeds in their bread) would like it, was just so-so. I'll need a chunk of time to revive my starter in order to make the sunflower seed with rye sourdough, so I'll probably get to that one over spring break (one week away!). So I decided to start with aloo paratha, a bread I had never heard of before it popped up on our list for March. Hamelman describes aloo paratha as "delectable filled flat breads [which] originated in India [that are] filled with potatoes, herbs, and spices [and] are a fine accompaniment to milder foods." I actually don't have any experience making Indian food, so I was excited and a little nervous to make these into a meal. One of the ingredients on the list is ghee, Indian clarified butter, which I actually had heard of before. I first read about ghee when Nicole posted a recipe for kettle corn (one of my favorites). I was intrigued with her claims that it makes the absolute best kettle corn and immediately bookmarked this recipe. But I'd never tried it...until now! To make the ghee, I first purchased a pound of the best organic butter I could find. I heated the butter over medium heat until it was melty and frothy and starting to boil, then I lowered the heat to low. I let it cook for 30-45 minutes, unbothered, as instructed. I spent the time obsessively researching, and it was clear that I was supposed to wait until I had three layers: a frothy top layer, a clear liquid middle layer, and a golden solid bottom layer. I obviously had the froth on top. I was a little perplexed by the use of the word "clear" to describe the liquid: clear as in transparent? colorless? uncloudy? At first I was waiting for colorless, but then realized the liquid was later described as "golden," so that was probably the wrong definition; I eventually decided they meant not cloudy. The bottom layer gave me the most problems. After letting the ghee cook for way longer than the 45 minutes, I still couldn't see a solid layer on the bottom, but I was really nervous about all of the warnings that it would burn, so I decided it was done. And then I saw that there were actually little specks of brown sediment on the bottom; not the thick layer I'd been watching for, but definitely solids. They were darker than golden, but still smelled good and weren't burned. Anyway, I let the ghee cool for 10 minutes and then strained it through coffee filters into a sterilized jar. I'm not sure coffee filters were ideal ~ it took forever ~ but I couldn't find my cheesecloth. The ghee smelled so tasty, and I was excited to use it for the aloo paratha tonight. For the filling, I mixed up boiled potatoes (Yukon golds), toasted cumin seeds, ground coriander, minced ginger, chopped green chilis (from a can), fresh cilantro (from my indoor herb garden), salt, and mustard oil made with mustard seeds (I couldn't find black mustard seeds). The dough was whole wheat flour, white flour, salt, and water. The dough is mixed and then rests for 30 minutes. I made eight little balls, pushed in the center, stuck in a ball of filling, and then sealed it up. The dough balls were then flattened and rolled out. And then I cooked them for a couple minutes per side in my cast iron skillet, brushing them with ghee half way through. The kids had great fun watching them pouf up in the skillet, and we nicknamed the bread "balloon bread." I placed them between kitchen towels and stored them in the (off) oven; they stayed warm while I prepared the rest of dinner: Indian-spiced chicken with tomato chutney from Cooking Light. The chicken was absolutely delicious; even the kids loved it which kind of shocked me. The chutney was addictive (although we didn't bother offering it to the kids, both of whom dislike tomatoes). I really enjoyed the aloo paratha, especially with the chutney. Hubby had about 3 1/2 of them with his dinner and declared it was a shame that they were so time-consuming to make. The kids both tried theirs but didn't eat more than a bite or two. All in all, a success, and I'm excited to try more of the Indian-spiced dishes I discovered when looking for something to accompany the aloo paratha. Margaret chose Emeril Lagasse for our March Twitter avatar fun, and then she posted a delicious-sounding jambalaya for her avatar recipe. We love jambalaya and we love pasta, so I bought all of the ingredients at the grocery store yesterday afternoon. And driving home with an easy soup on the menu for the night, I realized that it was Mardi Gras! What better way to celebrate than with jambalaya?! You can find the recipe on Margaret's site. I followed, with only two minor changes. One, I was a little worried with the amount of spice Emeril calls for: 1/4 cup salt in the pasta water, almost 1/4 cup of his "essence" spice blend. I knew that his cheesey snacks had too much spice for the kids. So I cut...not by a lot. I probably used one or two tablespoons of salt in the pasta water and 2/3 of the spice blend. The other change was cooking time; my skillet was really overcrowded and I was worried about my meats getting fully cooked, so I cooked it a bit longer at the end. Despite the lengthy list of ingredients and number of steps in the process, it was actually pretty quick and easy to prepare...took about 50 minutes total. We loved this dish! I served it with my first ever part-whole-grain ciabatta, which I made the night before, and which was delightful soaked in all the leftover juices. It was not too spicy at all...hubby probably would've been perfectly happy with Emeril's amount of spice; this version was just perfect for the kids and me. My hubby said, "I think we should've been celebrating Mardi Gras every day this week!" In other exciting news, my dad and stepmom bought me this indoor herbal garden for Christmas. I've used small bits of cilantro and basil before, but this recipe was the first time that I really got to use a bunch: fresh thyme and fresh basil. So fun! As the kids and I walked into the grocery store a couple of days ago, we were greeted by a store employee handing out little sample cups full of fresh blueberries. We couldn't resist. And even though they're not local, which makes me feel a little bit guilty, I couldn't resist buying a tub either. Sometimes in the midst of the longest winter EVER, you just need a break from apples and pears and other winter fruit. Last night, I wanted to do something fun with the leftovers of the giant tub we'd purchased. I found this recipe for blueberry crisp from Cooking Light and was happy to see I had all of the ingredients on hand. I didn't want to make a giant batch (the recipe makes an 11x17 baking dish) and we didn't have that many blueberries left, so I decided to make individual crisps instead. 1. Preheat oven to 375F. Butter ramekins (I used three 7-ounce ramekins). 2. Toss washed blueberries with first three ingredients (brown sugar, flour, lemon juice). 3. Combine flour, brown sugar, oats, and cinnamon. Mix in butter pieces until mixture resembles coarse meal (with pastry blender or food processor or, because it's such a small amount, I actually just used my fingers to crumble it all). 4. Divide blueberries equally between the ramekins. Sprinkle the topping over the blueberries. 5. Bake in a 375F oven for 25 - 30 minutes until topping looks golden and yummy and blueberries are bubbling. The verdict? As predicted, the baby girl (who doesn't like blueberries) didn't like it. Surprisingly, the little guy (who LOVES blueberries and all things fruit) didn't like it, either. But the hubby and I were not sad that the kids didn't eat theirs. We happily stole bites from their plates during dinner, and saved our own ramekins for after the kids went to bed...when we added a scoop of ice cream, of course. I will definitely make this recipe again! I posted my Emeril Twitter avatar recipe on Wednesday: cheesy snacks that I hoped would taste like homemade cheese hoppers (a.k.a. Annie's cheese bunnies or other commercial cheesy snacks). While my hubby and I enjoyed them, they were way too overly spiced for the kids. The very next day, Deb at Smitten Kitchen posted a recipe for homemade goldfish...how could I resist? These were so incredibly easy to throw together, especially since Deb gives weights, so all I had to do was dump everything into a bowl sitting on my scale: all-purpose flour, whole wheat flour, grated sharp cheddar cheese, salt, onion powder, and butter. I threw the bowl full of ingredients into my food processor, let it mix for about 90 seconds until it formed a ball, and tossed it into the fridge for a bit. The next part was the most time consuming: rolling the dough thinly, cutting out the shapes, and punching out eyes with a wooden skewer. I used my duck, butterfly, and cat mini cookie cutters. 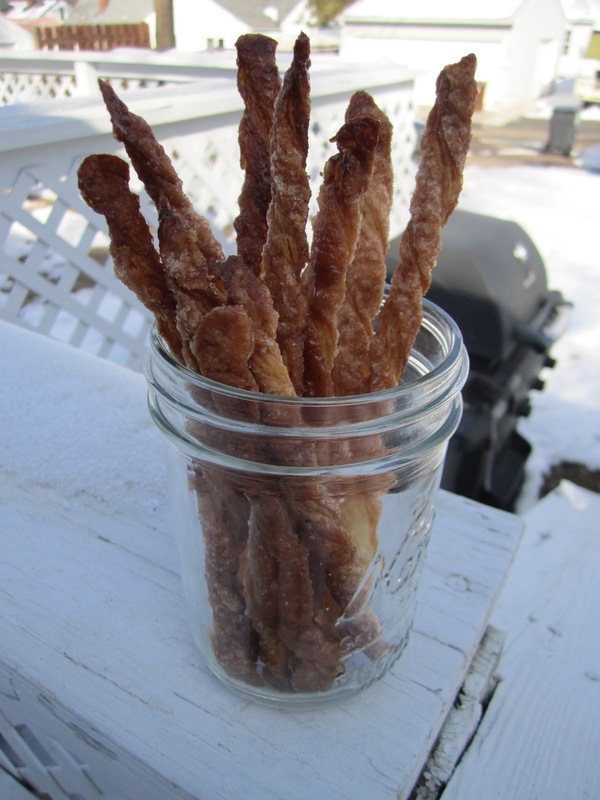 This recipe made three trays of treats, about 120, which cooked in 12 minutes in a 350F oven. They were crispy, buttery, and cheesy. Most of the first tray were already gone by the time the other two trays were done cooking and cooling. This is definitely a make-again recipe...Sorry, Emeril! This week's Bake! recipe was my pick...I've been eyeing the golden almond bars ever since I first opened this book. I made the sweet tart dough early this morning. It was easy to mix in the food processor: flour, salt, baking powder, butter, and eggs. I seem to have the same problem with NM's tart dough recipes every time...he doesn't call for extra water to be added, but I always have to put some in to get my dough to form a ball. This time, I added a little under a teaspoon of water, and that seemed perfect. The dough was easy to roll out, but I had a hard time getting it to be big enough without the dough ripping. Finally I realized that I was using my giant jelly roll pan, which was way too big. So I sized down to my smaller jelly roll and the dough fit perfectly. I lightly toasted 3 1/2 cups of slivered almonds while I made the topping: unsalted butter, sugar, light brown sugar, dark corn syrup, salt, and heavy cream. Right after sliding the pan into the oven, I went back to the cookbook and re-read the notes. Which is when I realized that these are supposed to be made in a 9x3x2...in other words, my cake pan! No wonder I had such a challenging time getting the dough and the toppings to fit...AND no wonder the bars seemed so thin compared to the picture in the book. No worries, they turned out fine. Well, actually we did have one major worry...after our first taste, hubby and I began to worry that we'd eat the whole pan! These are dangerously good. Twitter chef avatar fun: Emeril's homemade cheese hoppers! Margaret picked our March chef for our Twitter avatar fun...I was really excited to see that it was Emeril Lagasse. One of my favorite Christmas gifts this year was this cookbook that my kids (via my hubby, of course) got me. I've never cooked anything from Emeril before, but I was excited to have a kids' cookbook by a known chef. We own Pretend Soup and Salad People from Mollie Katzen, both of which we love, but I've found that a lot of other cookbooks geared toward little kids favor simplicity over quality and produce either tasteless or taste-bad food. The first recipe I made from my new cookbook (There's a Chef in my Soup!) was cheesy star snacks. One of my kids' very first snack foods was Annie's Honey Bunny Grahams. If you haven't experienced these, they taste like Teddy Grahams and look like little bunnies. We used to hop-hop-hop them across the table to the little guy when he was very small, and somehow he named them Hoppers...they've never lost this name. (In fact, while writing this paragraph, I actually had to go searching on the web to find the real name.) We still snack on normal Hoppers (the graham kind) and Cheese Hoppers (the baby girl's favorite). This name is engrained in our family community...One of our good friends was at work and a coworker of his had a box of Annie's on her desk. He saw them and said, "Oh, can I have a few Hoppers?" I'm sure she looked at him like he was crazy. Anyway, when I saw that Emeril had a recipe for cheesy star snacks, I knew I had to try them in the hope that they'd be homemade Hoppers. Hubby and I found them addictive; eventually, I had to send the remainder to work with him so we'd stop eating them...but they didn't taste like our Hoppers...way too overly spiced for the kids. 1. Mix flour, cheese, spices in a food processor fitted with the metal blade. 2. Add butter and pulse until the mixture resembles coarse crumbs. 3. Add cold water and pulse (or mix by hand) until mixture becomes a smooth dough. 4. Form dough into a disk, cover with plastic wrap, and refrigerate for 30 minutes. 5. Using a lightly floured rolling pin, roll dough to a 1/8 inch thickness. 6. Cut the dough using tiny cookie cutters (about 1 inch). Gather up leftover scraps, reroll and recut. 7. Place cut out shapes on a baking sheet and paint with egg whites. 8. Bake in a 375F oven for 15 minutes. Emeril includes a note at the end to experiment with different herbs and different cheeses. If I were to make these again with the children in mind, I would cut out the spices (or at least seriously reduce them) and just use cheese.